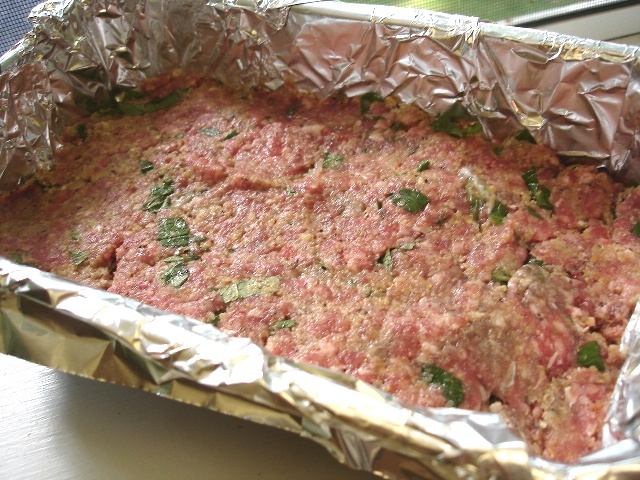 My son requested “Mint Meatloaf” for the menu this week. I made it last night for him and he gobbled it up his serving and insisted on saving all the leftovers for leftover night on Thursday. This recipe was one that we saw on the Phantom Gourmet television show. That show is literally torturous to watch especially because it’s on right before lunch on the weekends. They show such delicious food and our lunches afterward are always a little disappointing in comparison. I’ve attempted meatloaf several times that didn’t work out. We’ve made this recipe exactly as it is listed on the Phantom Gourmet website but that should be reserved for a weekend because it takes some time to assemble. It does make for a beautiful presentation. Our only complaint about that recipe is that it is very salty because of the prosciutto. My kids like the combination of the mint with the meat. For a weeknight dinner you could use my shortcut version below. Mix all ingredients except the bacon. Press into the loaf pan. 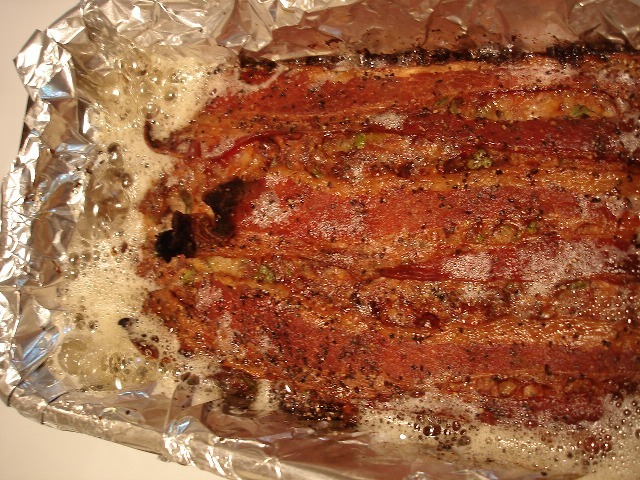 Cover the meat mixture with the bacon slices and sprinkle the top with some additional pepper. 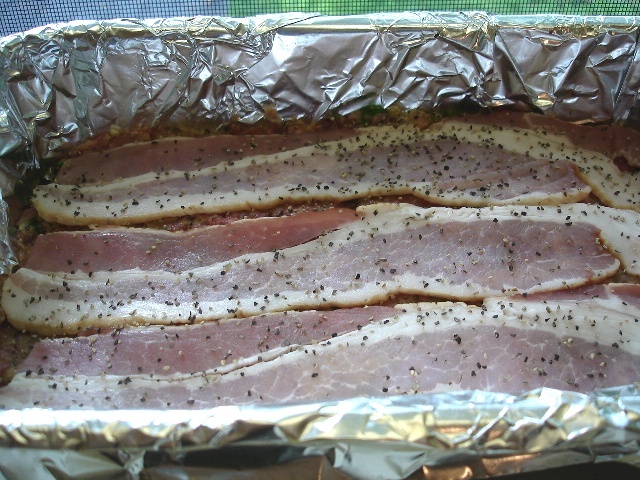 Bake in oven for 20 minutes or until the bacon is fully cooked. I overcooked this last night as you can tell from the photo at the top of this post. That makes it crispy on all the edges but we still enjoyed it. I’m also looking for some advice on cameras. Mine is dying a slow and painful death and I’m anxious to replace it as soon as I can but there are just too many to choose from so any suggestions would be greatly appreciated. Yummm this meat loaft looks juicy delicious! 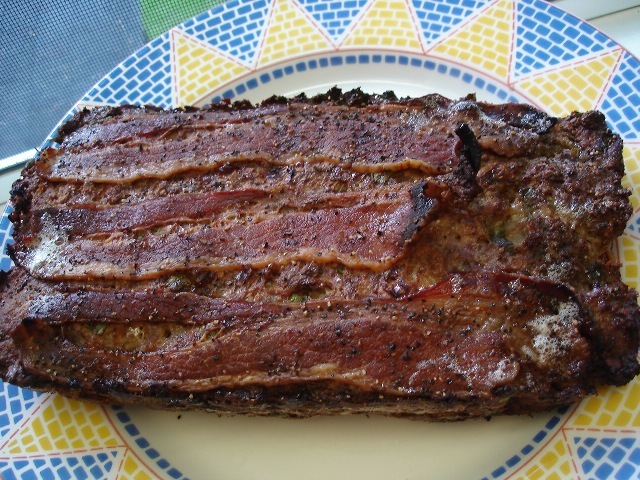 I have to try to lay bacon on top of the meatloaf like this. It looks amazing and sounds yummy. it do look delicious but i dont eat pork i will try the turkey crispy bacon and see how that works.